Manchester is in some respects a second home: the Song of the Goat Company has very close connections with Manchester Metropolitan University through the MA Acting programme run (mainly in Poland) with the university’s School of Theatre. The director, Gregorz Brai teaches on the collaborative drama course – based in Poland, the Teatre Pieśń Kozla/MMU MA. Gabriel Gawin (Macbeth) and most of the other performers have close working links with the same programme. This production complements the larger venture of promoting the richly diverse culture of Poland during the 2009/10 period, coinciding this year with the anniversary of the birth of one of Poland’s great composers, Chopin (click on Chopin & The Poet to read Charlotte's review of that). Song of the Goat Theatre’s Macbeth is different from popular Shakespearean productions. The text is not the driving force. This is indicated in the programme note – ‘Devised by the company’. In this Macbeth we see a series of performed statements developed from the inter-relationships that grew as individual performers explored the dramatic energy of a situation, emotion, state of mind. The actors themselves ‘create’ the play through their collective energy. It may be useful to recall how, in plays like A Midsummer Night’s Dream, Hamlet, The Tempest - to name but three - we get a glimpse of Shakespeare’s own company’s technique - the suggestive inventiveness of Shakespeare’s own drama - where schemes, scenes, ideas are thrown around, discussed, challenged. This is not , however, a ‘play within the play’, more about a play drawn out of, then brought back into, key moments of the play that is Shakespeare’s Macbeth. One has to come open-minded, prepared to be challenged, to rethink ‘performance’ when seeing this production. Theatre audiences have long come to expect to be challenged – by Brecht, Absurd Theatre, minimalism; this production of ‘Shakespeare’s’ Macbeth offers a new dimension to that expectation. If this performance has a socio-cultural point to make, it is not obviously based upon the politics of despotic power within the play. The challenge of the performance is almost Brechtian in a technical sense, challenging the audience’s expectations of how Macbeth and Shakespeare more generally can be performed – and viewed. This is an energetic production, with dynamic movement superbly choreographed, musical, rhythmic and ritualised. The challenge of this performance is in its reworking of the play, recreating it as a lived work, with every detail of the music, dance, polyphony, movement, gradations of lighting, choreographed settings – all strictly timed meticulously to create a sequence of intense statements on stage which often lead to a momentary pause of frozen motion before moving forward; and that challenges the audience to confront different points in the growing crises of a man doomed. All the characters are powerfully played within this range of narrative crises as it moves forward. A central force driving this production is “The Musicality of Macbeth (sic)”. The play, as the director, Grzegorz Brai emphasises in the programme notes and in the discussion with the audience after the performance, is rooted in music, rather than in the ‘literal’ text. Song of the Goat Theatre sees music as the basis for everything that happens in performance. Of course, Shakespeare’s own text is hypnotically and powerfully musical – the devil (Macbeth) always has the best lines. 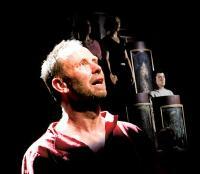 (Manchester has this autumn been blessed by the spectacle of damnation - two huge stage characters uttering some of the most beautiful poetry in the English language – and both damned – Faustus and Macbeth). This dual emphasis upon the musicality of the group performance and the individual developing an understanding of emotional intensity in relation to other members of the group – through song, chant, movement and words - suggests why this particular play became a natural focus for Song of the Goat. 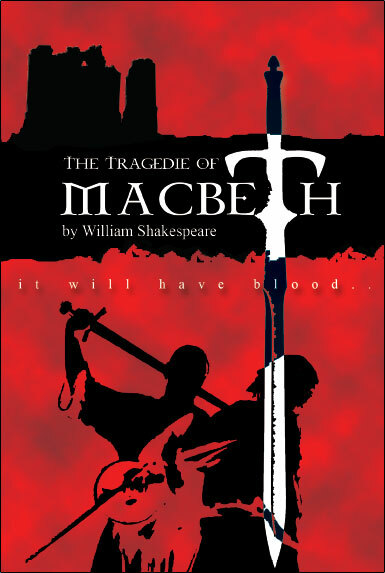 Shakespeare’s Macbeth derives its own force, after all, from tormented inner conflicts leading to the terrible treachery perpetrated on others: the dreadful, harrowing tragedy of personal hypnotic ambition with seemingly no redemption; a society suffering the consequences of murderous rule as he displays his total moral catastrophe. In this production we see played out on stage, through all the elements of the performance, the disintegration of the figure at the heart of that terrible predicament. The arena of action is a projection outwards of Macbeth’s own inner dreadful chaos. The performance is therefore a distinctive work of discrete but interlinked performed moments of emotional intensity and energy. Throughout the play all the actors are on stage, except Duncan for a time (naturally), dressed in costumes with just an echo of Japanese Noh plays, moving in clearly defined individual and group movements - without the mask and decorative fashions, however, but with a strong ritualistic element. Greek choric drama is suggested. The Korean kayagum – a beautiful stringed instrument with distinctive rippling echoes, played by Rafel Habel – suggests a richly evocative ‘commentary’ and accompaniment to the actions and words of the play – a choric figure in its own right, with its own voice. Individual set speeches filled with ambition, hate and self-reproach, against the harmony of a choric rhythm created by the other performers create a counterpoint of horror and beauty. The structured cadences of polyphony reinforce the sense of ritual and grace in a story about a man whose life is in total ruin. One could hear the harmonies of southern and mid-European music here – creating echoes of the ritualised chanting of a sacred text. Deliberate sweeps of body gestures and movement –almost with military precision (Macbeth was, after all, a soldier) - convey the energy of the violence, passion and dreadful doubts of the narrative. Revelatory moments, suggesting Macbeth’s vengeful relationship with his wife, indicate innovative ways of exploring the psychological licence that permeates the production. Macbeth on this occasion reveals how richly varied interpretation of Shakespeare can be, how deeply his work, like this production, is rooted in dramaturgy – in the potential of his acting stage to offer boundless possibilities for new ventures. Song of the Goat have brewed their own unique kind of potion and so far they seem to have hypnotised their audiences as much as those original witches hypnotised Macbeth himself. On a final note, it was valuable to have the opportunity, at the end of the play, to ask questions of the director, performers and others involved in the production. It reinforced the sense of how much theatre is valuably work in progress, always challenging at its best as here, enabling the audience to leave the theatre with much to ponder about Shakespeare’s Macbeth and Song of the Goat Theatre’s fascinating and beautiful recreation of central questions and tragedies raised by this enduring play. Though Macbeth tells us, “Life …is a tale / Told by an idiot, full of sound and fury / Signifying nothing”, Song of the Goat Theatre’s production reminds us that the ‘sound and fury’ can tell us a great deal that is new, inventive and challenging. Out of the ‘nothing’ came something significant and enduring last Thursday evening.